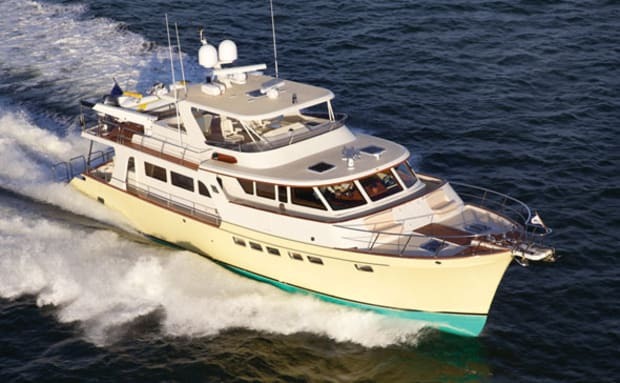 The Marlow Yachts 66E is a fine, seaworthy vessel. But the detailing and engineering that are generally hallmarks of the Marlow brand push her well beyond such stalwart adjectives. 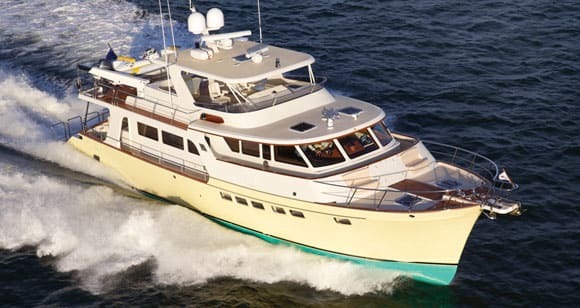 Having just completed a sporty little sea trial of the Marlow Yachts 66E on Tampa Bay, David Marlow and I were moseying up the Manatee River at about 10 knots, shooting the breeze in the boat’s teak-paneled pilothouse, heading for a temporary berth on the south side of Snead Island Cutoff. Marlow was at the helm, his huge weathered hands playing lightly over an intricately inlaid steering wheel with the confidence of Vladimir Horowitz rendering a French Suite. He was reminiscing about the old days when his dad turned out skiffs and other small boats, as well as poling oars and other salty gear, for the local inshore commercial-fishing crowd. “There used to be one of my dad’s ol’ skiffs in there,” Marlow said, pointing toward Snead Island Boat Works, one of the prettiest boatyards in the country and, thanks to some 81 years of marine service, one of the oldest. At the time, the Boat Works was just ahead and off to the left. What transpired next was just a tad surprising. In spite of the fact that the opening that led into the boatyard’s little marina and turning basin looked like it was about 25, maybe 30 feet wide, Marlow began manipulating the levers of the binnacle-type Morse engine control under his right hand, going astern on the port engine and pulling the starboard one back into dead-idle-ahead, thereby producing a virtually vibration-free pivot, thanks to the oil-filled shaft tubes and thrust bearings the drive trains of all of Marlow’s yachts feature. “Let’s go in and take a look,” he said. 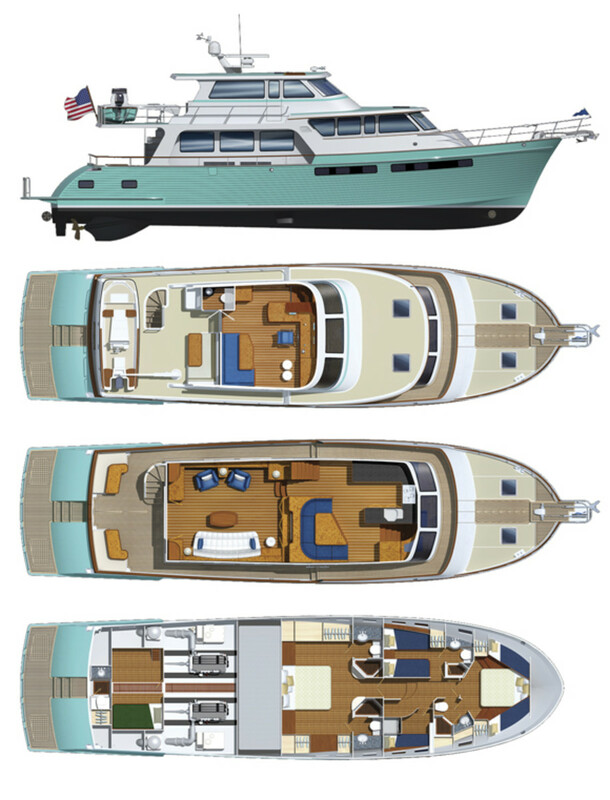 The long period of scrutiny that ensued, throughout which Marlow used the mains alone to poke around, failed to produce the skiff, although something perhaps even more compelling eventually materialized—the empowering sense of delight that results when a boat literally comes alive underfoot, thanks to precise, thoughtful, and experientially derived naval architecture. But hey, there was certainly some solid engineering involved as well. Indeed, while Marlow dodged and feinted amid the docks, slips, and pilings, I’m sure he was counting on the 66’s propellers staying relatively safe, thanks to patented, tunnel-mounted Velocijet Strut Keels that not only produce arrow-straight tracking in open water but also protect both shafts and propellers when the going gets shallow. Moreover, I figured he was also counting on these two, relatively abbreviated, strut-less Velocijets to seriously reduce the lateral resistance to sideways and rotational maneuvering that long centerline keels typically produce. And finally, I surmised he was counting as well on rafts of technological redundancy should trouble arise. Not only did he have two big, torquey Caterpillar powerplants at his disposal, he also had two powerful Vetus thrusters in the offing, bow and stern, as well as a Yacht Controller joystick and three independent, wholly redundant steering systems, two electric, one hydraulic! 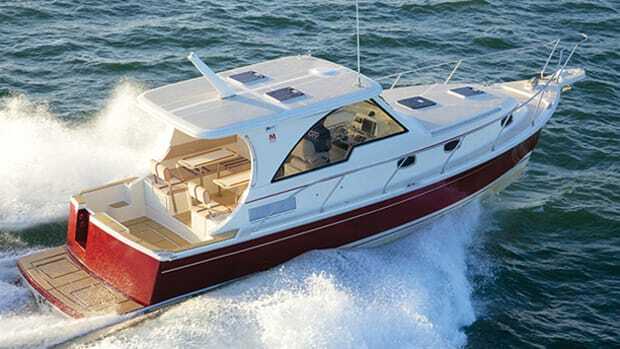 Smooth, mannerly maneuverability under claustrophobic conditions is a critical attribute of any good boat, of course, but performance is important, too. And the way the 66 had behaved earlier that morning on Tampa Bay during her sea trial was a tribute to Marlow’s dad and the salty boatbuilding heritage he’d obviously passed on to his son. 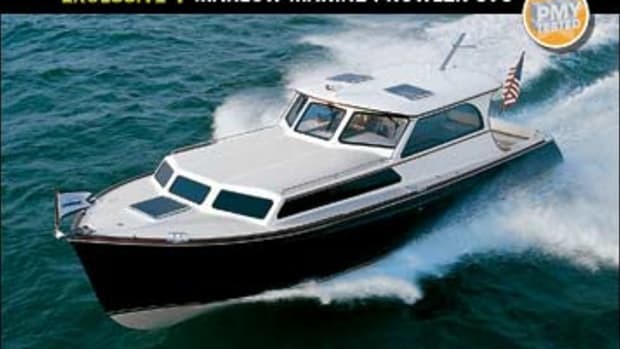 For starters, the average, two-way top end I recorded was 26.5 knots, a rousing speed that produced a (“utopian,” according to Marlow) load factor of 93 percent. Was the fuel burn of 112 gph a little, shall we say, ample at this particular data point? Yeah, but it nevertheless promises an owner a useful option should stormy conditions threaten or a scheduling problem obtrude. The other side of the 66’s personality manifested when we pulled the throttles back. 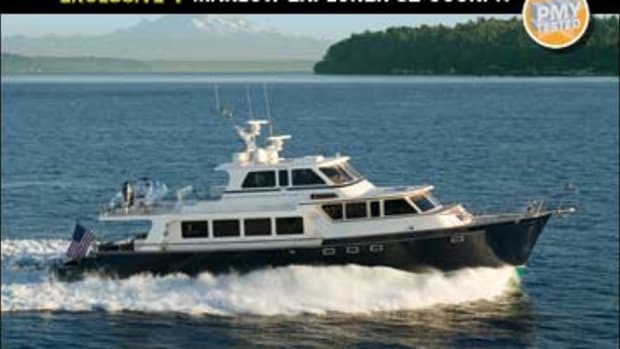 Thanks to a fuel burn of just 10 gph, which produces a comfortable, passagemaking speed of 9.3 knots, the 66’s range at 1,000 rpm turned out to be approximately 2,511 nautical miles, a figure that factors in a 10 percent safety reserve. 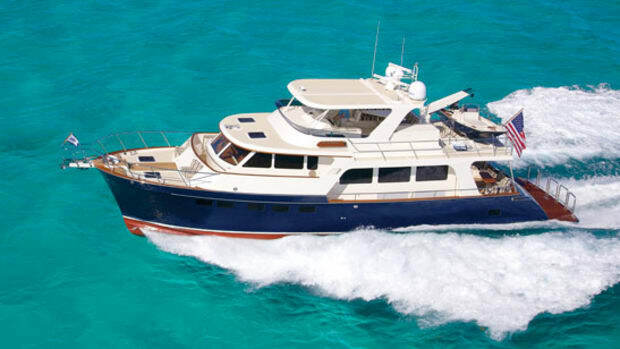 Couple this sort of far-ranging lope with the fact that all Marlow Yachts are certified by Lloyds and ISO 9001, as well as approved by Bureau Veritas for “Unrestricted Navigation,” and you’ve got yourself a true globetrotter in the 66, no question. Open-water handling was the equal of the close-quarters stuff. Turns were broad, as befits a straight-shaft inboard vessel, and they were also inboard-leaning (by approximately 4 degrees), thanks yet again to the Velocijets, in large part because they nix the tendency to heel outboard in turns via the aforementioned reduced resistance to lateral movement below the waterline. I also have to credit the Velocijets for the 66’s tracking, at least in part—the boat virtually steered herself when going straight ahead. 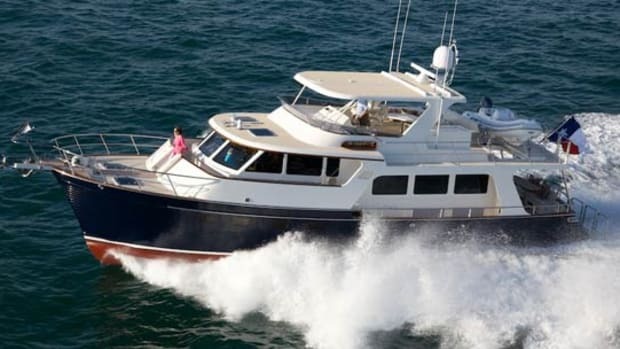 And sightlines from the flybridge helm were virtually unlimited although, from the pilothouse, the two watertight wing doors, port and starboard, were necessary for a definitive view aft. Sound levels at ocean-crossing speeds did not register much higher than the level of normal conversation. Over the years I’ve sea-trialed and examined many of Marlow’s vessels. And because the world-class levels of outfitting, engineering, and finish tend to be seen more or less across the board, I encountered many welcome and familiar features while touring the 66 (a three-stateroom-five-head boat, with crew’s quarters aft and an extra, stateroomy lounging area at the foot of the stairway leading belowdecks) once we’d arrived at Snead Island Cutoff. 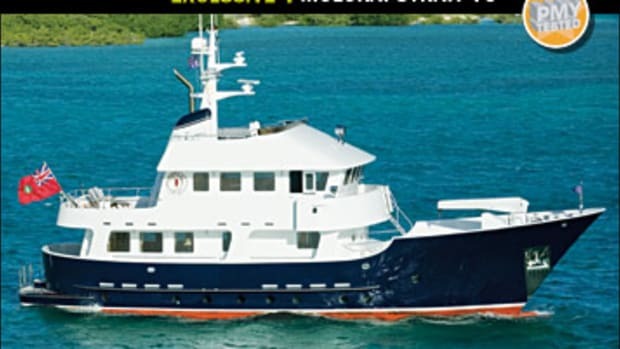 Some of these features included: duplex Racors in the engine room (on both mains and gensets); two sea chests in the ER as well, providing both redundancy and obviating the need for unsightly through-hulls at the waterline; a single, dead-simple-to-deal-with fiberglass fuel tank (with a well-protected sight gauge and a fuel-reserve-usability-boosting sump) that sound-insulates the full-beam master from the machinery spaces; a rock-solid hull courtesy of Marlow’s proprietary Full Stack Infusion process, whereby the entire laminate (including Corecell coring, Kevlar, carbon-fiber, and engineered biaxials) is infused with a super-powerful vacuum and dynamic-viscosity-adjusted epoxy resin in one comparatively short shot; premium galley appliances from Sub-Zero, Dacor, and Fisher-Paykel; premium hardware from iconic manufacturers like Seaway, Ocean Frigast, and Schwepper; and last but not least, book-matched, single-log, teak joinery that’s the equal of the best Europe has to offer. A short bridge passes over Snead Island Cutoff and, as I was crossing it in my rental car, after saying so long to David Marlow and his Marlow 66E, I slowed down to take a look over my shoulder. 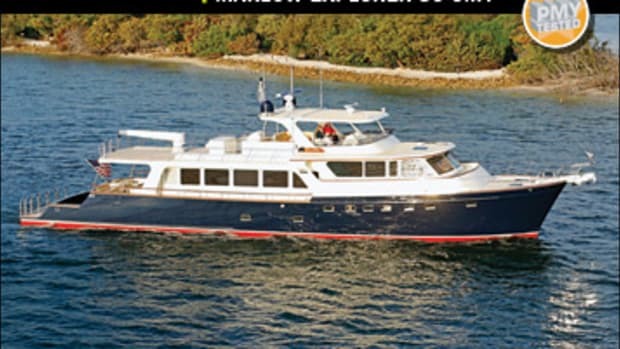 Maybe it was the boat’s yellow hull color. Maybe it was her faux-carvel planking. 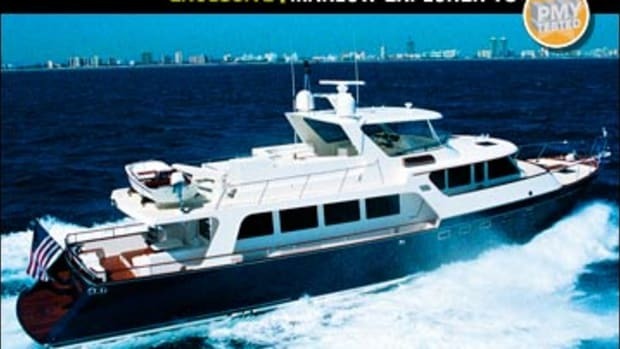 Maybe it was the massive, in-house-fabricated fairleads, cleats, and other on-deck hardware that shone in the Florida sun. But for one reason or another, the phrase “little ship” came to mind. And hey, she’s a fine little dream maker, too! 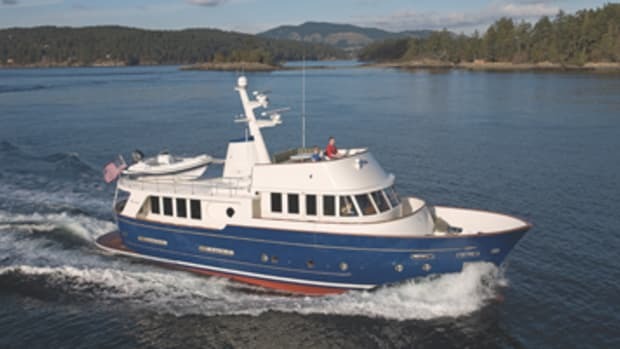 Click here for Marlow Yachts’s contact information and index of articles. 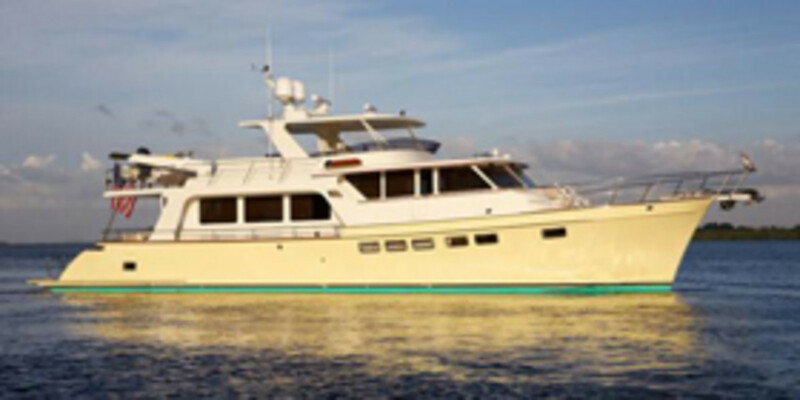 Click to see listings of Marlow Yachts Yachts currently for sale on BoatQuest.com. 500 gal. fuel, 260 gal. water, 3 persons, 1,500 lbs. gear.